Hello and welcome to exampundit. Here are the Daily Current Affairs 23 April 2018. These are important for the upcoming SBI Clerk Examination. The Reserve Bank of India on April 22, 2018 revised its “Know Your Customer” or the KYC guidelines, following the government’s decision to update the ‘Prevention of Money Laundering’ rules in June 2017. RBI made linking of national biometric ID Aadhaar to bank accounts mandatory. However, this will be subject to the final decision of the Supreme Court on making of Aadhaar mandatory. Till now, an officially valid document of address proof along with PAN card and a recent passport size photograph were the key KYC documents. India’s largest IT outsourcing company Tata Consultancy Services (TCS) on April 23, 2018 created history by becoming the first Indian company to reach the USD 100 billion Market Capitalisation (m-cap) mark. TCS’ shares were being traded 4 percent above the previous closing mark at Rs 3545 on the Bombay Stock Exchange (BSE) at 10.30 am on April 23, hitting an all-time high. The market value of the company at that time stood at Rs 6,79,332.81 crore ( USD 102.6 billion). Earlier on April 20, 2018 the company was on the verge of achieving this milestone as its m-cap value stood above USD 99 billion. TCS’ m-cap value matches that of other international stock-market players such as Accenture, United Technologies, GlaxoSmithKline PLC, Lockheed Martin, Nike and Volkswagen AG. President Ram Nath Kovind on April 22, 2018 promulgated the Fugitive Economic Offenders Ordinance, which will allow the government to confiscate properties and assets of loan defaulters who flee the nation. The President approved the ordinance following its approval by the Union Cabinet chaired by Prime Minister Narendra Modi. The Fugitive Economic Offenders Bill was introduced in the Lok Sabha on March 12, but it could not be taken up for discussion due to disruptions in the house over various issues. The ordinance seeks to confiscate properties of economic offenders who have left the country to avoid facing criminal prosecution. The provision will apply for economic offenders who refuse to return, persons against whom an arrest warrant has been issued for a scheduled offence as well as willful bank loan defaulters with an outstanding of over ₹100 crore. The ordinance also provides for confiscation of assets even without a conviction and paying off lenders by selling off the fugitive’s properties. Such economic offenders will be tried under Prevention of Money Laundering Act (PMLA). The Cabinet Committee on Economic Affairs (CCEA) on April 21, 2018 approved the restructured centrally sponsored scheme of Rashtriya Gram Swaraj Abhiyan (RGSA). The scheme will be implemented during the period from April 1, 2018 to March 31, 2022 at the total cost of Rs 7255.50 crore. Of the total cost, the Central share will be Rs 4500 crore and the State share will be Rs 2755.50 crore. The Rashtriya Gram Swaraj Abhiyan scheme will be now extended to all the states, union territories (UTs) and in all the institutions of rural local government in non-Part IX areas, where Panchayats do not exist. The restructured Rashtriya Gram Swaraj Abhiyan scheme will have both Central and State Component. As Bata’s new brand ambassador, she’ll be seen promoting the brand’s newly launched Bata Red Label fashion collection along with their other ranges. Tata Sons today announced the appointment of former Indian foreign secretary S Jaishankar as Tata Group’s President, Global Corporate Affairs. Jaishankar will report to Tata Sons Chairman N Chandrasekaran, the company said in a statement. Tata Sons further said Jaishankar, who was Indian foreign secretary from January 2015 to January 2018, will work with Tata companies to help them strengthen their business presence and positioning in their respective geographies globally. Mario Abdo Benitez, who represents Paraguay’s long-dominant Colorado conservatives, won the 2018 Presidential Elections on April 22, 2018. Abdo Benitez won 46.49 percent of the vote, against his centrist opponent Efrain Alegre who fetched 42.72 percent votes in a race that was far closer than expected. The results were announced by Paraguay’s Election Chief Jaime Bestard. Canada and the European Union will together host the world’s first female foreign ministers’ meeting on September 21, 2018 in Canada. The meeting will be held for 2 days. The announcement was made by the Canadian Foreign Minister Chrystia Freeland on April 22, 2018 in Toronto. The female foreign ministers from about 30 countries will be invited to the gathering, which is aimed at deepening global discussion on women’s empowerment. 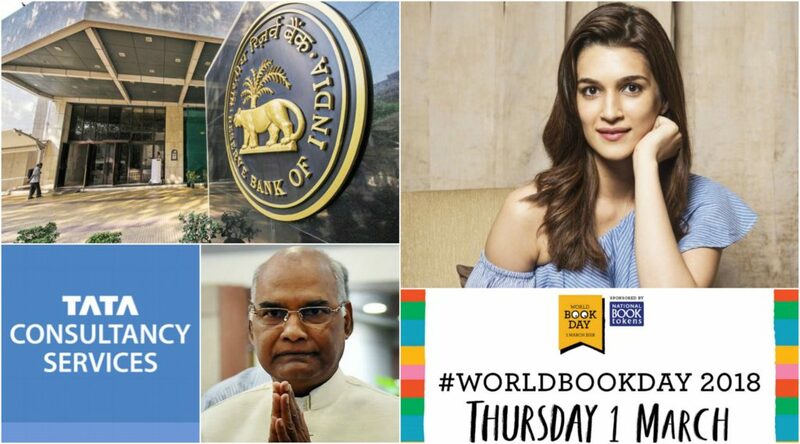 The World Book and Copyright Day was observed across the world on April 23, 2017 to highlight the power of books and to promote UNESCO’s vision of knowledge societies that are inclusive, pluralistic, equitable, open and participatory for all citizens. The World Book and Copyright Day pays tribute to books and authors by encouraging everyone to discover the pleasure of reading. This year, UNESCO designated Athens, Greece as the World Book Capital for 2018. The city of Athens was chosen for its efforts in making books available to the city’s entire population including migrants and refugees. India won 10 gold medals at 8th South Asian Judo Championship in Lalitpur, Nepal. Indian women grabbed 7 gold while men won 3 out of total 7 gold medals in the individual category. Indian women such as Garima Chaudhary, C. Jina Devi and Tulika Maan showed their golden performance at the championship. Nepal and Pakistan bagged two gold medals each.